Leave the veal knuckles to defrost in the fridge overnight. Remove them from the fridge half an hour before you’re ready to start and allow them to reach the right temperature. Preheat the oven to 150°C. Peel and finely chop the celeriac and carrot. Peel and dice the onion too. Briefly sauté the onions in a little oil in a roasting pan. Add the celeriac and carrot and fry until lightly brown, then pour in the white wine and veal stock. Add the herbs and spices and place the veal knuckles in the pan. Cover the pan and roast in the middle of the preheated oven for around 40 minutes. In the meantime, boil the potatoes along with the caraway seeds in salted water. Drain off the water and then run the potatoes briefly under the cold tap. Peel while still warm and then slice. Peel, halve and de-seed the cucumber, then slice. For the dressing, heat the veal stock. Stir in the vinegar and mustard then season to taste with cayenne pepper, salt and pepper. Peel and dice the onion and sauté in butter until translucent. Pour the onion and butter mixture over the potato slices, add the dressing and mix together carefully. Then stir in the cucumber and season the potato salad to taste once more. Wash, dry and finely chop the chives into thin rings. Dissolve the cornflour in a little cold water. Strain the juices from the roasting pan, then bring it back up to the boil and stir in the cornflour mixture to create a rich gravy. 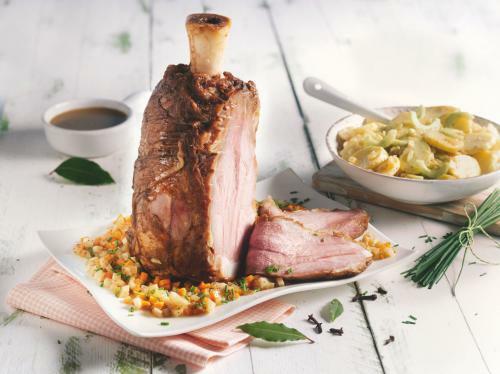 Serve the vegetables in a shallow, pre-warmed dish then place a veal knuckle on top. Arrange the potato salad alongside it and garnish with the chives. Pour over a little gravy and serve the rest separately. Serve immediately.